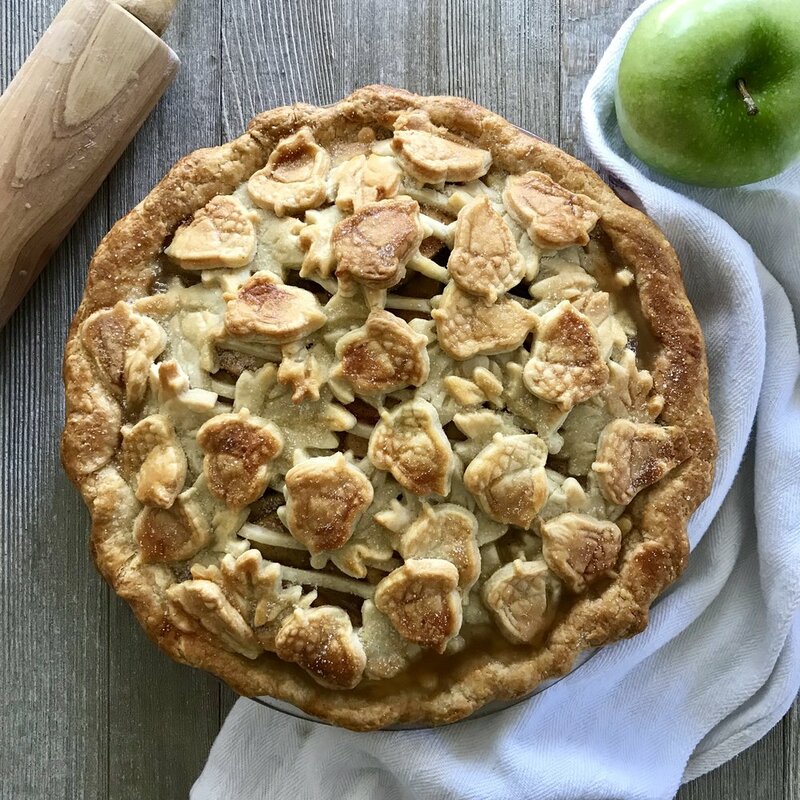 Grandma’s Apple Pie – Updated! My great-grandmother Ruby Nunn always enjoyed her apple pie with a slice of sharp cheddar cheese. As a child, I remember how classy she seemed, compared to me with my slice and a messy scoop of melting vanilla ice cream. This recipe is named after her, and in her honor, I will always give my guests a choice of sides. But it’s always ice cream for me! Preheat oven to 425° and set oven rack in the middle of the oven. Peel and slice apples (slices should be thin, but need not be uniform). If you have a food processor, use the slicing blade to speed up the process. Place apple slices in a large bowl. Add lemon juice. In a small bowl, mix together brown sugar, salt, cinnamon, nutmeg and flour until well-combined. Pour the dry mixture over the apples and, using your hands, toss until all slices are fairly evenly coated. Place one pie crust in a 9-inch pie plate Add half of the apple mixture. Place four slices of butter, spaced evenly, on top of the apples. Add remaining apple mixture, arranging the slices so they form a small mound. Top with remaining butter. Place second pie crust over filling. Seal the edges of both crusts by pressing the crusts together, and then tucking them under to form an even edge. Use your hands to form a decorative scalloped edge if desired. With a sharp paring knife, make four 1-inch to 2-inch slits in the top pastry. The slits should form a cross shape, but without meeting in the center. If you want to add decorations, use cookie cutters to cut out shapes using extra dough. Place these on around the edges or over top of the pie. These can be used instead of or in addition to a second pie crust. Cover edges of pie crust with a pie shield. (If you do not have a pie shield, no worries. It helps but is not essential.) In addition to the pie shield or instead of the pie shield if not using one, gently lay a piece of foil over the top of the entire pie — this will protect the top crust (or lattice or decorations) from burning. Bake pie at 425 degrees for 20 minutes on a rack in set in the middle of the oven. Remove pie from oven and remove foil laying over top (but leave pie shield if using one). Reduce heat to 375 degrees and bake pie for 30 more minutes. Remove pie from oven and sprinkle with sugar. Return to oven and bake for 10 more minutes or until apples are tender when a toothpick is inserted through one of the slits. Cool for 1-2 hours before serving. Tightly wrap unbaked pie in plastic, making sure all sides of pie are completely sealed. Place pie in freezer for up to 2 months. When ready to bake, heat oven to 450 degrees F. Remove pie from freezer and unwrap but do NOT thaw. (If using a glass or ceramic pie plate, let the pie sit on counter at room temp for about 15 minutes. This is to prevent the glass from cracking as a result of drastic temperature changes.) Add egg wash if desired. Cover edges of pie crust with a pie shield or ring of foil (to keep the crust from burning). In addition to the pie shield, gently lay a piece of foil over the top of the entire pie — this will protect the top crust (or lattice or decorations) from burning. Bake pie at 450 degrees for 25 minutes on a rack in set in the middle of the oven. Reduce temp to 375, remove foil but leave pie shield if using, and bake for 40 minutes more. Remove pie from oven and sprinkle with sugar. If the crust is nice and brown, replace sheet of foil loosely over top to prevent crust from burning. Return pie to oven and bake for 10-15 more minutes or until apples are tender when a toothpick is inserted through one of the slits.